Two months ago, I talked about Clash Royale’s micro-transactions and my thought process for deciding on whether I should pull the trigger on an in-app purchase or not. During that time, I decided to hold off on sending any of my hard-earned cash towards SuperCell’s (the makers of Clash Royale) way. Well, Clash Royale had a big update recently which included several new deals. So here I am again to assess what SuperCell has to offer to us Clash Royale fans. First off, we have what are called Arena Value Packs, which are one-time offers for each Arena that you’ve reached. I’m still iffy on these so pardon the vague descriptions but here’s what I know: Value Packs appear in the Shop whenever you reach a new Arena and randomly once a week until you’ve bought all of the Value Packs. I’ve seen Value Packs for Arena 4 and up, and I’m not exactly sure if the contents and pricing for each Value Pack is fixed but what I do know is that they contain one special Chest and a number of Gems and Gold and that prices vary from $0.99, $4.99 up to $9.99. Some of Clash Royale’s Arena Value Packs. Are they worth it? If you compare what you’re getting from a $9.99 Royal Arena Value Pack with how much purchasing Gems and Gold can cost you, it’s clear that Value Packs will give you more bang for your buck – it normally costs $9.99 to buy 1,200 Gems alone, so spending that same amount of money on a Royal Arena Value pack will get you the same amount of Gems plus $4.99 worth of Gold and a Super Magical Chest. That’s insane value. This is how much it’ll cost you to buy Gems and Gold in Clash Royale. But is it worth it? It depends. The contents of the Chest will be random as always, so what you’re really buying in these packs are the Gems and the Gold. It’ll take a while, but you can earn the same number of Gems and same amount of Gold for free just by playing and opening chests. If you’re in a hurry to upgrade cards and move up the ranks, that bunch of Gems and Gold will help a lot. Maybe you’ve been wanting a specific Legendary Card and it’s available in the Shop? A Value Pack may not necessarily give you that Legendary, but it’s definitely going to give you the 40,000 Gold (or close to it) that you’ll need to buy it. Or maybe you’re in a tournament and you need to do several card upgrades in order to win, but you don’t have the necessary Gold for it. Buying a Value Pack will give you more Gold than if you buy Gems directly. So if you need Gems/Gold right away, an Arena Value Pack is a good purchase. Now let’s move on to Epic and Legendary Chests. Another special type of Chest, Epic and Legendary Chests can show up randomly in the Shop. They don’t contain any Gold whatsoever – Epic Chests only contain 10 Epic cards, while Legendary Chests have one Legendary card. You need to spend 500 Gems to purchase a Legendary chest and 10,000 Gold to purchase an Epic Chest which means that they cost roughly the same amount as 500 Gems will get you 10,000 Gold. That’s $4.99 in real-world money. Are these worth it? Again, it depends. I bought both an Epic Chest (with Gold that I accumulated for free) and a Legendary Chest (my very first Clash Royale cash purchase!) and my experience with the two were very different. I had gotten 1 Guards, 2 X-Bows and 7 Giant Skeletons in my Epic Chest – all cards that I don’t use – so I was very disappointed. I felt that I had wasted my 10,000 Gold. On the other hand, I had gotten a Sparky in my Legendary Chest. It wasn’t the Legendary card that I was really hoping for (Ice Wizard or Princess would have made me ecstatic) but it’s still a great card to have. The main difference between Epics and Legendaries is that Legendary Cards are already playable out of the chest, whether in Tournaments, Challenges, or in standard battles. Epics need to be upgraded to Level 4 for be truly competitive in Tournaments and have to at least be at Level 3 in any type of high level competition to work. And you not only need multiple copies of an Epic card to upgrade it, you also need loads of Gold too (something that these chests don’t have). In fact, I’ve been staying away from using Epic cards because of this (I only use one in my main deck – Poison). I think this would apply to more people too – you can get lucky with an Epic Chest and get what you really want/need, or you can end up with duds. But only those who already have several Legendaries (or someone who draws The Log) would be disappointed in the contents of a Legendary Chest. I would only recommend Epic Chests to someone who is looking to get several different Epic cards (more than five different ones) but Legendary Chests are great purchases for it’s impulse friendly price of $4.99. Lastly, let me talk about the revamped Tournament mode and the new Victory Challenges feature. These aren’t in-game items that you buy; they’re special modes of play that require Gems. Let me talk about Tournaments first. There’s no cost in joining a Tournament, but you need Gems in order to start your own. SuperCell revised the Tournament structure and made it more affordable to create small ones – the cheapest Tournament that you can create used to cost 500 Gems, but now you can create a 50 person Tournament with just 100 Gems. With $4.99, a small Clan will have the Gems required to hold a weekly tournament for an entire month (a total of five, to be exact). Bigger Clans can start a 100-person Tournament for the same amount of money. This takes me back to my CCG-playing days. Me and a handful of friends would pool our money, buy several booster packs, play a mini-tournament and divide the contents of the booster packs as prizes. A 50 person Tournament will have prizes for the top ten players, so if you can form a group of ten you can play a small Tournament wherein everyone will get a prize. If you’re all cheapskates, each person will only have to shell out $0.50 in order for the group to afford to have 5 different Tournaments. And it’s not even about the prizes, but the experience of being in an actual Clash Royale tournament format that makes it all worth it. If Tournaments are geared towards a group experience, Victory Challenges are for individuals. Victory Challenge is a mode of play wherein you’ll need to spend Gems to play; once you’re in a Challenge, you will have to play a certain number of matches. Each win will get you a certain number of cards and Gold as prizes. Getting 12 wins will get you the top prize, but getting three losses will mean that the challenge is over and you’ll be awarded according to how many total wins you had. Battles are capped to Tournament Standards, which means a more even playing field than normal battles. The Victory Challenges feature is a great addition to Clash Royale. Classic Challenges are cheap to enter at just 10 Gems; for perspective, you can buy 80 Gems with $0.99 – that will cover the entry fee for eight total Classic Challenges! If you’re really good (or really lucky), you can string up a total of 12 wins to get the top prize of 100 cards and 2,000 Gold! 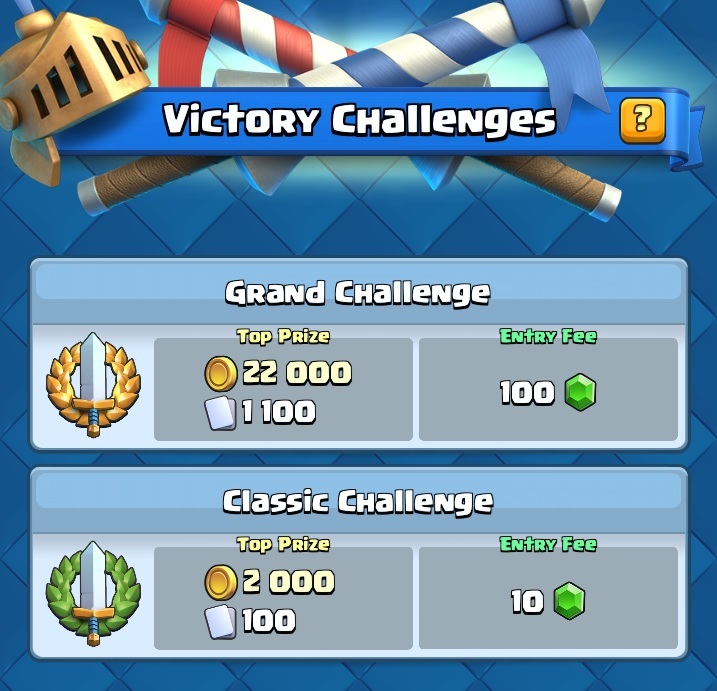 Grand Challenges are more expensive with it’s entry fee of 100 Gems but that top prize of 22,000 Gold and 1,100 cards for just over a dollar is hard to ignore. Personally, while I’m all for spending the Gems that I accumulate for free, I don’t think it’s worth to spend any money on Victory Challenges. But that’s because I don’t think I’m skilled enough to really maximize my money’s worth. For someone who’s really good at the game, entering either Classic or Grand Challenges would be the best way to get cards and Gold – 500 Gems can get you 50,000 Gold in the Shop, but a highly skilled player can more than twice that plus more than 10,000 cards by consistently getting the top prize of Grand Challenges for the same number of Gems. And there you have it, the new ways of spending your hard earned cash in Clash Royale. I can see other people spending more and more on the game because these options are of good value. Personally though, I’m patient enough to accumulate Gold and Gems for free, so I’m only looking to buy the next Legendary Chest that comes my way and will probably opt out of Value Packs, Tournaments, and Victory Challenges. What do you think about the new in-app purchases available in Clash Royale? Have you spent money on the game recently? Let us know what you bought and how you felt about it by leaving a comment or two below! Are Clash Royale’s In-Game Purchases Worth It? Thanks for the comment. I don’t know if you’re agreeing or disagreeing (it’s not clear). I did say that it is the gold/gems that make Value Packs a high value purchase. But I don’t need all that Gems/Gold that much, not enough to shell out Php500. You need advice? Hmm, the best way to get Legendary cards is to work your way towards Arena 10, save up 40,000 gold, and wait for your desired Legendary card to show up in the in-game Shop. No need to spend real money.